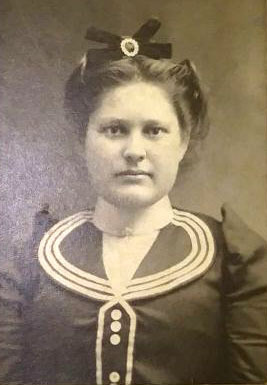 Eltha Elwood Fisher, c. 1895. Eltha Elwood Fisher Moose, c. 1906. Eltha Elwood Fisher Moose, c. 1940s. Luther H. Moose family, c. 1906. Front row: Frank Winders with daughter Margaret, Carl, Luther H. Moose, Floyd, Eva Frances Troutman Moose. 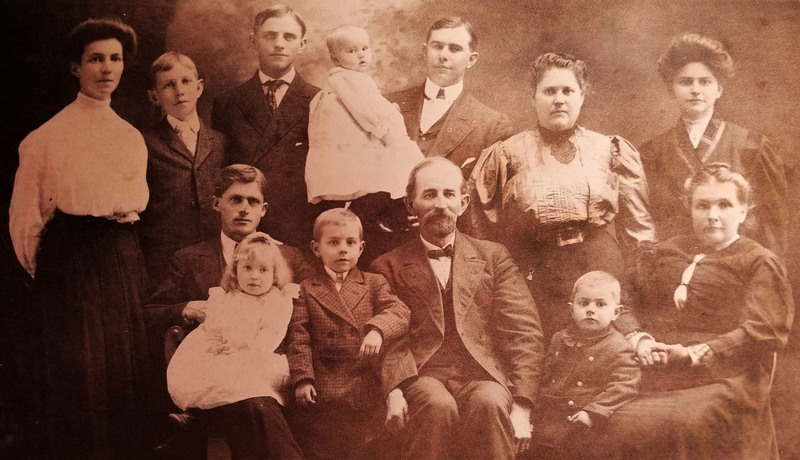 Back: Annie Moose Winders, John D., Paul, Jacob O. holding Thomas Luther, Eltha Fisher Moose, and Elsie. From book Dutch Buffalo Creek Meeting House/Bethel United Church of Christ, 1974. The Jacob Fisher Family, 1727-1958, Compiled by James L. Fisher, Arthur W. Fisher, Hilbert A. Fisher, 1958, p. 230. ELTHA ELWOOD FISHER, b. 1991, d. 1956, m. Jacob Otho Moose, b. 1879, d. 1951. 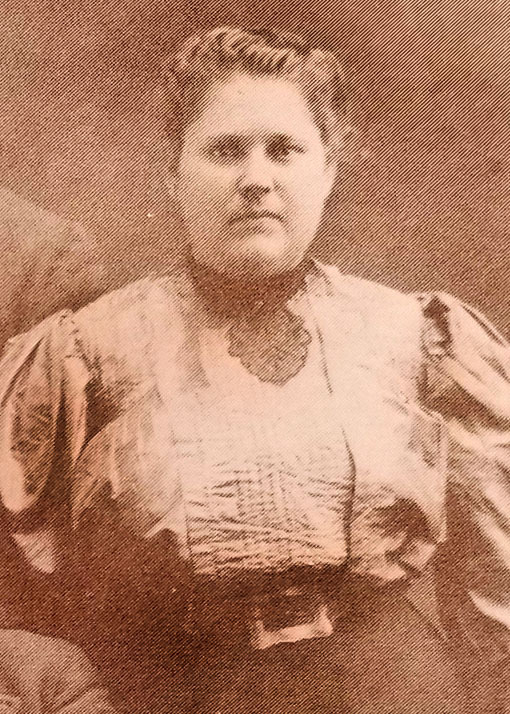 Children: Frances Adelaide, b. and d. 1905 – Thomas Luther – Jacob Otho, Jr.
Eltha E. Fisher was the youngest child of Thomas M. and Margaret Barringer Fisher. She attended Mt. Amoena Seminary and was very active in the women’s work of the Reformed Church. 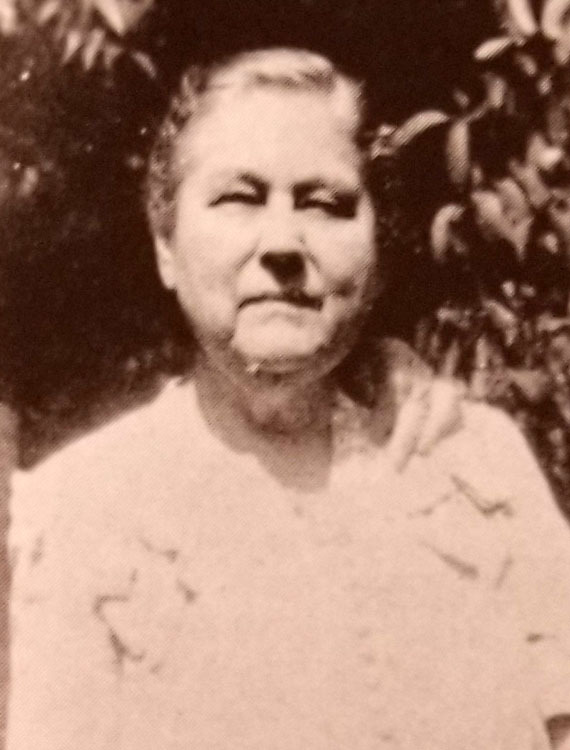 Mrs. Moose was also a member of The American War Mothers. Her husband, Jacob O. Moose attended Catawba College. He served nine years as Deputy Sheriff and later was Coroner of Cabarrus County and for a number of years on City of Concord board of light and water commissioners. For thirty-three years he was associated with Cline & Moose grocery firm in Concord. Active in various phases of church activity, Mr. Moose was many years an Elder in Trinity Reformed Church and served for twenty-three years on the Board of Trustees of Catawba College. Two sons were born to this union. Thomas L. Moose (1906) who graduated from N. C. State College in 1928 after which he spent five years in Lima, Peru, South America, and later was Superintendent of Nazareth Orphanage. Jacob Otho Moose, Jr. (1916) finished at Catawba College in 1938, served with the Ninth Air Force in World War II and is Secretary and Treasurer of Carol May Finishing Company, Concord. Both sons have been active in religious affairs and are Elders in the Reformed Church. The Concord Times (Concord, NC), December 30, 1904, p. 3. Mr. Jacob O. Moose and Miss Eltha Fisher, daughter of Mrs. Margaret Fisher, of No. 8 township, were married at 4 o’clock yesterday afternoon at the bride’s home. The ceremony was performed by Rev. C. P. Fisher, brother of the bride. It was a quiet wedding, only the members of the immediate families being present. At 1 o’clock this afternoon a dinner will be given the bridal party at the home of the groom’s father, Mr. L. H. Moose, of No. 7 Mr. and Mrs. Moose will make their home in Concord with Mr. H. C. Hahn on Mt. Pleasant road, and will arrive here next week. Mr. Moose is our deputy sheriff and has a large number of friends in Concord and Cabarrus. His bride is a popular young woman and will be welcomed to Concord. The Concord Times (Concord, NC), October 15, 1914, p. 14. Jacob O. Moose is so generally known to the people of Cabarrus county that he needs no introduction. Born down on the Dutch side of the county and reared there, then moving to Concord and in all this time being closely associated with his fellow citizens, his acquaintances reached into the hundreds. And for htis genial citizen to make an acquaintance usually meant to make a friend. He is the son of Mr. Luther H. Moose, of No. 7 township, and is 35 years of age. In December, 1914 , he married Miss Eltha Fisher and they have one son. They make their home on East Corbin street. Mr. Moose is not a stranger to public office. For nine years he served as deputy sheriff of the county, under Sheriffs Peck and Harris. Two years ago he was nominated and elected coroner, being one of three Democrats elected to office that year. This year he was again nominated for the office, receiving the nomination by acclamation. The Charlotte Observer (Charlotte, NC), February 11, 1925, p. 11. CONCORD, February 10. – Four women were injured and three children bruised Monday afternoon on the Kannapolis road when a man from Charlotte, who gave his name as Gus Economou, skidded so quickly across the road directly in front of the car they were driving that they were unable to get out of the way and a crash resulted. The injured are Mrs. W. C. Lyerly, several ribs broken and badly bruised; Mrs. G. T. Crowell, left arm broken at the wrist and also badly bruised; Mrs. L. P. Davis, bruised; Mrs. J. O. Moose, an injured leg and possible internal injuries. The three children were miraculously uninjured except for some slight bruises. The ladies were on their way to Kannapolis to look over the Reformed parsonage there, preparatory to planning for a parsonage for the Reformed church here when the accident occurred. None of the women were thrown from the car, but one of the children, Ray Lyerly, about three years of age, was thrown from his mother’s lap, where he was sitting, through the windshield and was lying on the front fender when picked up. He was not even bruised. Billy Lyerly and Otho Moose, the two of the children, were both slightly bruised. Mrs. Crowell and Mrs. Moose are in the Concord hospital from their injuries. Mrs. Moose had an operation on her leg in order to remove the key which jammed in it when she fell forward. Economou gave bond for $250 for his appearance at court.